I didn't have administrator rights on the system and couldn't run the Windows Task Manager to kill the process using it. But I could kill it from a command prompt using the taskkill command, though I had to use the /f option to force the termination of the process. 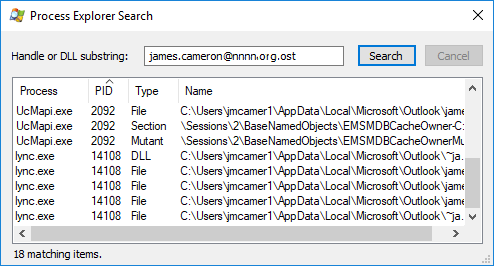 I wasn't able to copy the file immediately afterwards, but I was able to copy it shortly afterwards at which time when I searched on the "handle or DLL substring" in the Process Explorer Search box again, no results were returned. C:\Users\jmcamer1>tasklist /fi "imagename eq lync.exe"
C:\Users\jmcamer1>taskkill /fi "imagename eq lync.exe"
SUCCESS: Sent termination signal to the process with PID 14108. C:\Users\jmcamer1>taskkill /f /fi "imagename eq lync.exe"
SUCCESS: The process with PID 14108 has been terminated. INFO: No tasks are running which match the specified criteria.